31st Jul 2014, 11:00 AM in Meanwhile! So it turns out the preceding strips have been leading up to this, a sequel to The Apotheosis of Ricky Imes. From his cosmic vantage point Ricky can see not only all the characters in the Fuzzball & Scuzzball comic strip, but characters in other comics as well. What comics? Well . . .
Thurl, the orange guy with tentacles, is from the Laser Brigade. You can read all of their thrilling adventures online at the Laser Brigade page here. There are two volumes, the first one by me, and the second one featuring stories by Matt Kish, Josh Burnett, Doug Meyer, and me. The little round black-and-white fellow near the middle is also from Laser Brigade; he's the Keeper of the Way, the axis about which reality revolves. He was created by Matt Kish. Curvana and Eeko, the two monsters who are talking to someone named Chuck, are members of Monsters Against Robots. You can read the exciting, kid-friendly story of these heroic monsters defending Monster Town from the Evil Robot Empire here. Go on, it's short, it'll only take a few minutes. M.A.R.s was co-created by D.F. French and me. The little green guy who looks like a 20-sided die is Happy D20, from the Happy D20 Adventures comic strip I used to do with Josh Burnett. We already talked about H-Bomb and Udanax; Whiskey-Drinkin' Bear, like them, is from Don't Quit Yer Day Job. Scalene Joe appeared in the Zimberwack Winter Extravamaganza and the Zimberwack Summer Extravamaganza; the panel here is from a story called "Perfidious Intent." Holly Thornton is from Esoterica #1-2. If you don't already have those comics, you won't be able to find them, so just go ahead and imagine that they are amazing. Greetor ("Quake, puny humans!") and The Other ("?") are from Rad Dude Book 4, a work in progress. 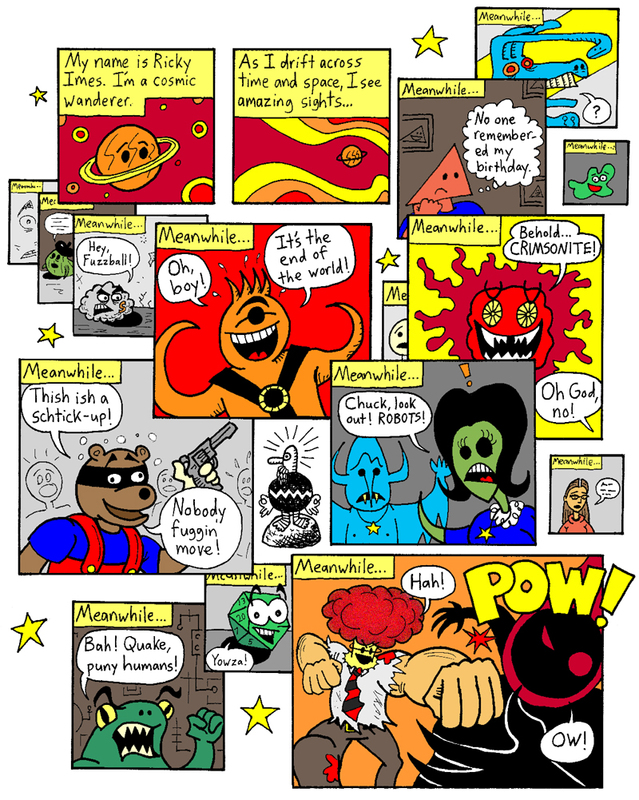 Rad Dude himself has already appeared in this comic strip. Crimsonite is from a comic called Barn Bots. He's my favorite Barn Bots villain. Crimsonite was created by D.F. French. So there you go--a whole bunch of comics characters, created over the course of four decades. Hopefully revisiting all these different phases of my creative life has allowed me to integrate the disparate parts of my psyche, resolve lingering issues from my past, and forge a stronger, more cohesive artistic identity as I move forward. Next Week: Udanax meets Ricky Imes!